We started small back in 1997, just growing pumpkins and selling them at a road side stand. In 1999, we grew into somewhat of a small business. We put in our own 5 acre corn maze. Now we had a place to call a pumpkin patch/corn maze. The corn maze provided a means to bring the people to us. We built two hay ride wagons to carry people back and forth to the pumpkin patch. Since there was such a good response, we added Indian corn, gourds, corn stocks and baked goods. Each year it seems like we add something new. We now have a bounce house and small corn box for the kids. There are also cows on site, wich are part of our working dairy farm. In 2009, we started running a train ride with two more small wagons. 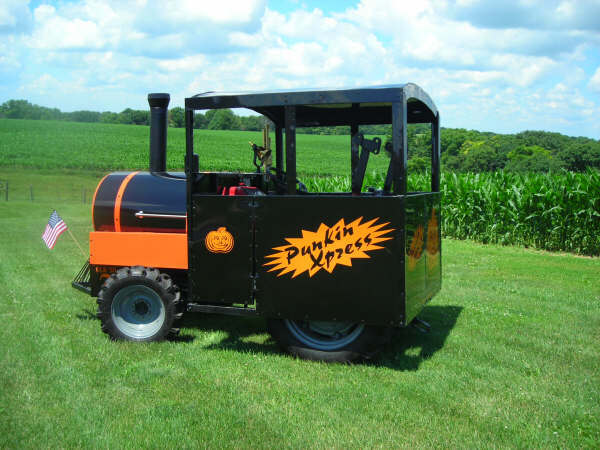 These will transport people to and from the pumpkin patch. Everything at the farm is done by family, friends and neighbors. In 2015, we added the pumpkin blaster, a cannon that will shoot pumpkins at a specified target located out in our field. This year marks the 17th year we have been open, and it has been very enjoyable meeting lots of people who continue to come back every year.